Our customers place high demands on our products. is firmly embedded into our corporate philosophy. for plastic pipes for some 50 years. development with our new innovations. we even develop special production processes. 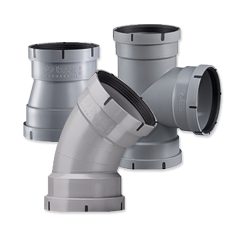 For around 50 years, we have been involved in the development and production of moulded pipe components made of thermoplastic polymers for ventilation systems. On this page you can find the latest information about our product innovations and at which trade fairs you will be able to visit us next. On this page you will find animations for our products.